Big Basket offers different categories of products such as oils, rice, dals, dairy products, vegetables, fruits, frozen products, energy drinks, sanitary products, personal care products, household products, kitchenware and more. Some of the popular brands available at BigBasket include Tropicana, Kellogg’s, Ariel, Horlicks, Galaxy, Dettol, MTR, Britannia, Colgate and more. Big Basket offers help you save up to 50% on your orders. Browse through the wide variety of items available at the site, use the BigBasket coupons and get heavy discounts on your order. Big Basket bundle pack offers provide you one pack free on purchase of one pack. Shopping at Big Basket lets you get branded items at discounted price. Like Big Basket,Grofers also giving huge discounts on grocery orders. To get those deals check Grofers Offers and save more. Here is a small list of Big Basket discount offers. Big Basket is providing a discount of 20% on first order valued Rs.1000 and above. You can get additional 20% cashback on your first order by paying with Paytm wallet. Become a Big Basketeer by registering at the site giving the required details such as name and delivery address. Choose the delivery slot, place the order and your order will be delivered at the time as requested by you. Big Basket provides same day delivery for orders placed before 12:00PM. To avail the Big Basket 1st order offer give the coupon code BBGO76-033F13 at checkout. You can get additional 20% cashback by paying using Paytm. Big Basket 1st time offer is valid only on orders of value Rs.1000 and above. The 20% cash back offer can be availed directly by paying using your Paytm wallet. No minimum cart value has to be met to avail the Paytm cashback offer. The maximum amount of cashback that can be obtained with Paytm is limited to Rs.150 per transaction. The offer is valid only for new users on their first order. You can find these type of deals in Nature’s Basket also, They are giving discount on every grocery order. The offer is not valid on Edible oils, baby food, and ghee. Big Basket provides a wide range of products from different brands at discounted prices. It is offering a discount of 7% on orders of value Rs.1500 and above. The discount can be availed very easily and does not require any coupon code. The minimum order value has to be Rs.1500 and above to avail the offer. Maximum cashback amount that can be obtained per transaction is limited to Rs.500. Each user can use the offer for 12 times. The offer is not valid on Edible Oils, Ghee, Fruits and Vegetables, Feeding Bottles, Baby Foods, Cothas Coffee, Patanjali, BB Royal, Eggs, BB Popular, Tata Shakti, Marico Bio Oil and selected Dairy products. The offer cannot be used along with other Big Basket promotional offers. The offer is valid on orders made through the website and mobile app. Big Basket is the preferred online grocery store for the majority of the customers because of the availability of wide range of products, multiple payment options and delivery as requested by the customers. PayUMoney collaborates with third-party payment gateways such as PayUMoney, Paytm, Mobikwik and FreeCharge others to make it easy for its customers to make payments. PayUMoney in collaboration with Big Basket is offering a discount of Rs.250 on orders of Rs.1000 and above for PayUMoney users. Open your Big Basket account. Choose the products of your choice and add them to the cart. Choose the preferred delivery slot. Choose to make the payment using your PayUMoney wallet. Give the Big Basket PayUMoney coupons code BBPAYU20 at checkout to avail the discount offer. Make the payment and get your products delivered to your doorsteps without any hassles. Pros: Get More Discount Offers On Your Every Grocery Orders. Big Basket mobile app lets you shop groceries, fruits, vegetables and household items on the go saving your time. Using Big Basket mobile app, you can not only purchase your groceries very easily but also enjoy great discounts. Big Basket is offering a discount of 10% on orders of value Rs.2500 and above for its mobile app users. The app is free to download for Google Play Store and App Store. Login your Big Basket account. Choose products of your choice. Build your cart for a value of Rs.2500. Select your preferred delivery slot from the available slots. Get the Big Basket app offer coupon code available here and provide it at checkout to get the discount. Select the payment option of your choice. Make the payment and get your items delivered to your doorsteps. Cash on delivery orders can also avail the offer. The minimum order value has to Rs.2500 to avail the discount. Each user can use the coupon for 12 times. The offer is valid on orders made using the mobile app and web app. The 10% discount offer is not valid on Edible Oils, Feeding Bottles, Pillsbury and Aashirvaad Atta, Baby Foods and Ghee. 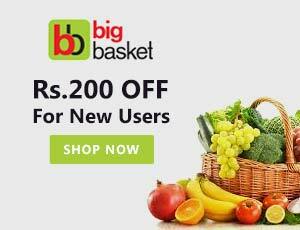 Big Basket new user discount offers provide great discounts on first-time orders. It introduces new deals everyday on various products. Information about the available Big Basket deals in your location can be obtained from the promotions and discounts page on bigbasket.com. The website is well designed and is easy to navigate. Big Basket ecoupons provided along with the purchase of selected products provide discounts on orders made at partnering sites. Big Basket welcomes new customers with exciting deals and discount offers. The Big Basket new customer offer provides a flat discount of Rs.200 on first time order. Register with Big Basket giving your details such as name, address and other details as required. Now, choose a convenient delivery slot to deliver your order. Choose the items of your choice, add to the cart and place the order. Give the coupon code FBDEC200 at checkout to avail a discount of Rs.200 on your first order. BigBasket coupons for new users are valid only on the first order. The first Offer you can get in Grofers also, They also giving special discount on their first order. To get those discount check Grofers First Order Promo Code and save more on grocery shopping. Big Basket not only provides great discounts and BOGO offers on its products but also provides E-vouchers that can be used at the specified stores. Big Basket is offering movie ticket vouchers worth Rs.200 on the purchase of Kellogg’s Chocos boxes. Open your Big Basket account. Purchase the Kellogg’s Chocos Boxes range. No coupon code is required to obtain the Big Basket E-voucher code for movie tickets. Make the payment. The Big Basket e-voucher code will be sent to your inbox or registered mobile number. The offer is available only on purchase of selected range of Kellogg’s Chocos Boxes. The maximum amount of e-voucher value that can be obtained is limited to Rs.200. Big Basket guarantees to offer the best quality products at best prices for its customers. It also assures of delivering the orders at delivery slots chosen by the customers without fail. The new express delivery system launched in collaboration with Delivery promises to deliver the emergency products within one hour of placing the order. To deliver fresh products to the customers, it plans to invest on energy efficient vehicles with cooling facilities. It offers free delivery for orders valued Rs.1000 and above. Shopping at Big Basket can be completed in four easy steps – choose the products of your choice, select the delivery slot, place the order, make the payment and the products will be delivered to your doorsteps. It offers online payment options and cash on delivery option. The different online payment options include net banking, payment through debit or credit bank of all popular banks. Big Basket is the right place to shop for all your home needs including vegetables, fruits, groceries, household items and more. 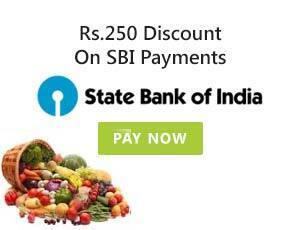 Big Basket in collaboration with SBI is providing a flat discount of Rs.250 on orders of Rs.1000 and above. If you are new to Big Basket then register at the site by providing the name and address. Existing users can login the site using the registered username and password. Pick the delivery slot of your convenience and place the order. Make sure to make the order value of Rs.1000. Give the Big Basket promo code BBSBI250 at checkout to avail the discount. Make the payment using your SBI credit/debit card.The offer is valid only for new users. The offer is valid only for SBI credit or debit card users. 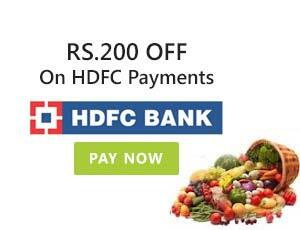 Big Basket is offering a discount of Rs.200 on order value of Rs.1000 and above for HDFC bank customers. HDFC customers can purchase any item of their choice from various available categories of products such as Groceries, Vegetables, Fruits, Household items and more. Login your Big Basket account using the registered username and password. Choose the delivery slot. Build your cart for the value of Rs.1000 including products of your choice. Place the order. Choose to pay using your HDFC credit or debit card or net banking to avail the offer. Give the coupon code BBHDFC200 at checkout to get the discount of Rs.200 on your bill. The offer is valid only for HDFC Bank customers. The minimum order value has to be Rs.1000 to avail the offer. Maximum discount that can be obtained on your order is limited to Rs.200. The offer is valid only for new customers of Big Basket. The offer is valid till 30th January 2016. Big Basket the largest grocery chain in India is launched in the Year 2011 by Mr. V S Sudhakar, Mr. Hari Menon,Mr. Vipul Parekh,Mr. Abhinay Choudhariand Mr. V S Ramesh.Big Basket operating in 7 metro cities Hyderabad, Bangalore, Chennai, Mumbai, Pune, Vijayawada-Guntur, Delhi, and Coimbatore plans to expand to 35 cities by the end of 2016. Big Basket mobile app lets you shop on the go saving you time and efforts. This is a best online grocery store offering about 14,000 products from about 1000 brands. It has everything that you generally include in your monthly shopping list. It provides multiple payment options, easy refund policy and guaranteed on-time delivery service. Shopping at Big Basket is definitely relaxing and easy. Big Basket is the largest online grocery store in India that offers about 14,000 products and 1000 brands. Bigbasket.com is operated by Innovative Retails Concepts Private Limited. It was launched in the year 2011 by a team of personnel passionate about the online shopping business – Mr. V S Sudhakar, Mr. Hari Menon, Mr. Vipul Parekh,Mr. Abhinay Choudhari, and Mr. V S Ramesh.It is currently serving in 7 seven metro cities and plans to expand its services to approximately 35 cities by the end of 2016. It has opened huge warehouses to serve in neighboring cities of the metro cities it is currently serving. To make shopping easy for the customers, it designed Big Basket mobile app for Android and iOS users. These smart apps save your shopping time by predicting your needs depending on your previous orders. Big Basket app coupons can be obtained at this site and they offer huge discounts on your order. The company aims to raise its revenues to 200 crores by March 2016. I Like Express Delivery In Big Basket, After Denomination Change Most Of The People Using Big Basket Express Delivery. And I Got Rs.100 Discount By Using Coupon BBEX100.